MMP- How did the band get started? MMP- What kind of music do you play? 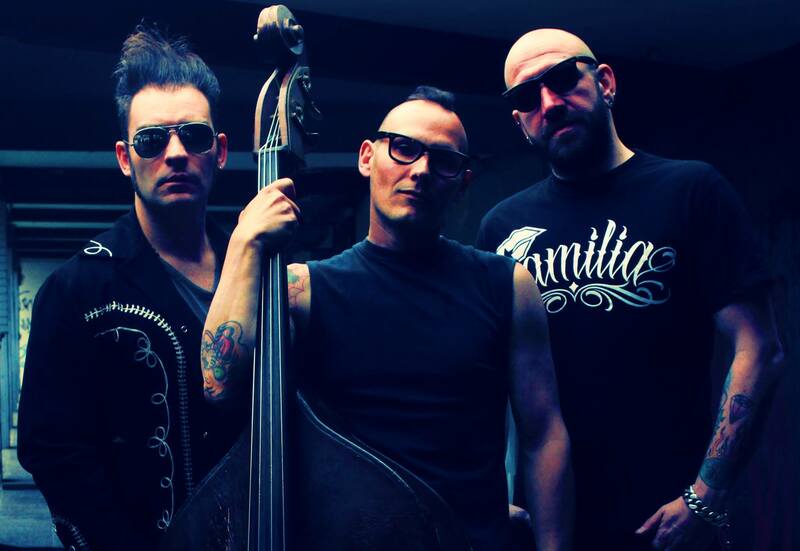 Lucky Dados – We are so much into rockabilly, but its hard to put a tag, we liked to do a kind of more”wild” rockabilly..our first japanese record label used to call us PUNKABILLIES..so maybe they?re right..
MMP- How has the fan response been? MMP- Where did the band name come from? MMP- Introduce the band members and what they do in the band? MMP- Who writes the music? Lyrics? MMP- And where do the lyric ideas come from? love, hate, rock and roll..u know..
MMP- What is your view in Satanism and Occultism? MMP- How many albums/CD’s have you released? MMP- Tell me about some the songs on the latest CD? MMP- Do you have any side projects? Lucky Dados – yeah, we all three have it, me and the drummer are also in LABELLE, the bass player is also with Marcos Sendarrubias and Baby Horror, among others..
MMP- Who are some of your musical influences? Lucky Dados – Oooooh its so difficult to say…we listen from old time jazz and swing, to hard Rock, 50s Rockabilly, Punk…so i could say..COUNT BASIE, STRAY CATS, THE CLASH, SOCIAL DISTORTION, MOTORHEAD SINATRA, COCHRAN, VINCENT….u know..there are so many..
MMP- What is the band like when you play live? MMP- Have you guys ever played in another country? MMP- How big of crowd shows up at shows usually? MMP- How is the crowd response when you play? MMP- When do you guys plan on writing any new material? Lucky Dados – We?d like to release a new album next year…but who knows..maybe soon maybe later..
MMP- What does the future hold for the band?? Lucky Dados – Hope that very cool things!! hahhaah, now we?ve started workin with a horn section, THE BORDER HORNS, and im lookin foward to record some new stuff with them.